Doua i Abbey is home to a community of monks of the English Benedictine Congregation. 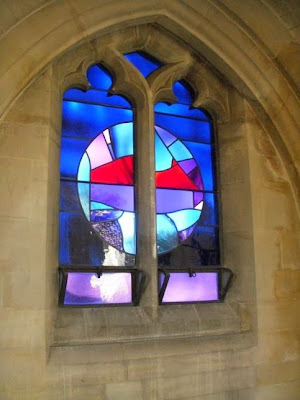 The monastery is under the patronage of St Edmund, King & Martyr, and was founded in Paris in 1615. Uprooted by the French Revolution it came to settle at Douai in Flanders. After more political turmoil the community of St Edmund finally returned to England in 1903, to Woolhampton in Berkshire, at the invitation of the Bishop of Portsmouth. The interior of the abbey was quite a surprise, as I expected it to look not quite so traditional. When I left, the exterior was once again a surprise, and I felt somewhat as if I had been in two different structures. 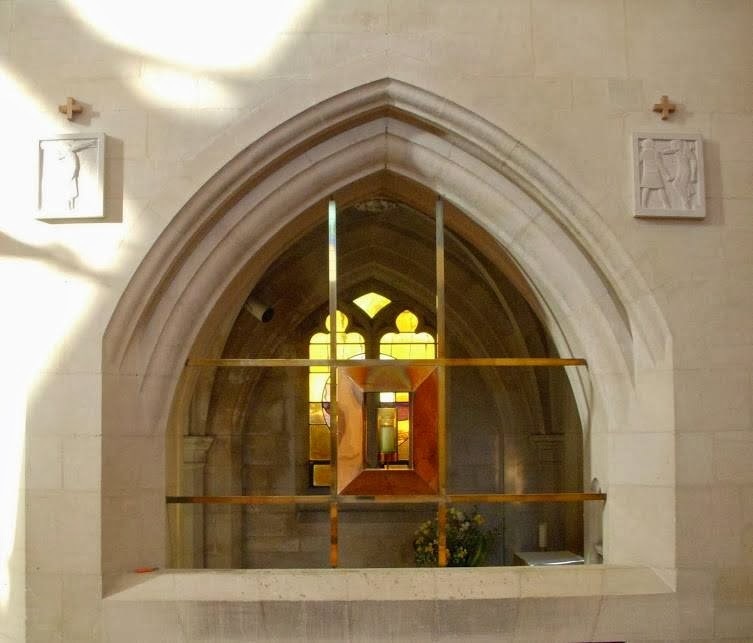 The interior includes contemporary touches, such as the techie lighting, the crucifix, and the stained glass windows. The close-up of the crucifix is stunning. In the abbey, the crucifix is positioned quite high, so the close-up after cropping the photo is an exquisite surprise. I intended to post the stories of my travels in chronological order, but I had writer's block when I tried, so the posts will be about whatever strikes my fancy at the moment. Image of the exterior of the abbey from Wikipedia. JCF, I am so sorry. I accidentally deleted your comment when I hit the delete button rather than the publish button. Do you remember what you said? I agreed that the interior looks a lot different than the exterior. 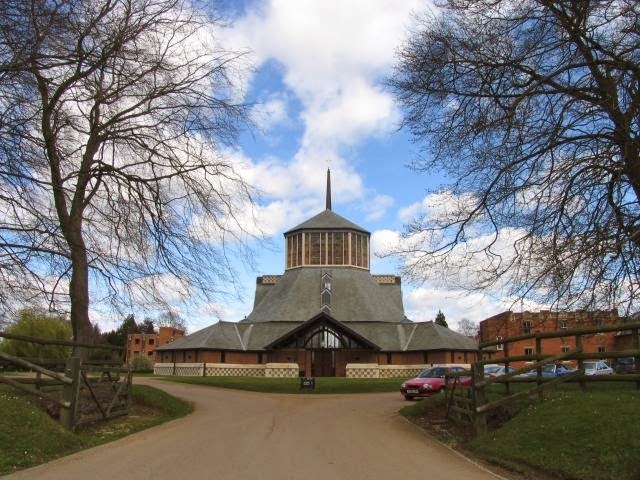 I said that I thought the name "Douai Abbey" was rather in-your-face (Roman contra Anglican), and wondered if my (everyone's) 20th century ecumenical efforts were for nought. But "we live in hope": perhaps things will be better w/ Francis. The monks came from Douai in France, thus the name. I don't know whether it was intended to be in-your-face. One of the monks asked where I was from, and when I told him, he said, "You have a lovely accent." I was beyond thrilled, because I am self-conscious about my accent when I'm in England since one Englishman mocked my drawl and told me because of the way I dragged out my words, it took me forever to say anything. FYI, re Anglican History: when the CofE was freed from the El Papa, recusant RCs left Blightey for Douai, where they were trained to be RC priests, to be deployed (I use that term advisably---remember the Spanish Armada!) back to the Sceptred Isle. Ergo, to name your Abbey "Douai", is to say "we are celebrating Anglo-Roman conflict" (and probably Playing the Victim: "Don't forget, heretics, you made us leave for furin' parts, to become priests of the One True Church!"). It is notably anti-ecumenical (as opposed to a name that could build upon the *common* history of Anglicans and Romans).